The Port of Cape May, based on its scallop catch, moved up four places in the nation’s rankings for seafood landings. LOWER TOWNSHIP - You won't hear too many commercial fishermen in the Port of Cape May complain about the government's Atlantic sea scallop regulations. That's because they're too busy catching the succulent shellfish, selling them and putting cash in the bank. Scallop harvests, boosted by federal regulations that close off huge sections of the ocean to let them grow big and plump, helped the port, which includes docks in Lower Township and Wildwood but none actually in Cape May, move from the eighth largest in the country in 2007 to No. 4 in the nation last year. "I've been through some bad times. This is a feel-good time," said Keith Laudeman, who began scalloping in 1976 and now processes them as owner of Cold Spring Fish & Supply. Figures released this week by the National Oceanic and Atmospheric Administration, or NOAA, show the Port of Cape May landed $73.7 million worth of seafood in 2008, up from $57.7 million in 2006, and the highest total in at least three decades. Most of this money, $56 million of the $73.7 million, was from scallops. Short-finned squid was a distant second with a value of $4.1 million. "Without scallops, it's not a pretty picture. If they shut down the scallop industry tomorrow, it would be devastating," Laudeman noted. Those landing figures are the dollars paid to fishermen for their catch. NOAA Fisheries Service figures each dollar can be multiplied by six times as the fish or shellfish make their way to seafood markets, restaurants and other outlets. That puts the value of the port's catch at $442 million. "If you look at the value, that's welders, truckers, the grocery guy, fuel oil, gear, shipyards, a fisherman buying a new car or a television or a house, it just keeps on going, on and on," said Laudeman. The port landed $23.6 million worth of scallops in 2006 and $42 million in 2007. The catch keeps rising, and many credit the regulations. In the 1980s, when scallop regulations allowed unlimited fishing, the entire state of New Jersey was landing only $15 million worth of scallops per year. Beginning in 1990, the government began changing the way it managed scallops by limiting the catch, closing off sections of ocean bottom to let scallops grow, mandating gear that lets small scallops escape and requiring an electronic system to monitor fishermen. This led to resurgence in stocks. Laudeman said it turned a "derby-style, boom-and-then-bust fishery" into a steady one. Wayne Reichle, of Lund's Fisheries here on Ocean Drive, said the latest batch of figures from NOAA Fisheries Service covers 2008 in which an area off Cape May known as the Elephant Trunk was opened to scallop fishing after being closed so the shellfish could grow. Scallopers were allowed three trips to the elephant trunk last year, and it drew boat crews from all over the East Coast, who often sold their catches here. "On value, there's no doubt scallops are the highest," Reichle said. While figures for 2009 will not be out until next year, Reichle noted scallopers got three trips to the Elephant Trunk again this year and one trip to another area that had been closed off the Delmarva Peninsula. Lund's Fisheries specializes on what is known as "underutilized species," fish that Americans are not crazy about but foreigners covet. Lund's sells to countries in Asia and South America. Jeff Reichle, Wayne's father, just returned from a sales mission in China. Although not worth as much, underutilized species held most of the top spots in pounds landed in 2008. Menhaden, which Lund's sells as bait, was the top catch in the port at 30 million pounds but it sold for only $1,898,324. It was the fourth highest value fish at the port. Short-finned squid, which Lund's sells for bait and human consumption here and abroad, was the second highest fishery in pounds at 23 million and was second in value at $4.1 million. Mackerel was third most landed at 9.3 million pounds and fifth most valuable at $1,349,384. Scallops were fourth in landings at 8.2 million pounds but tops in value. Atlantic sea herring was fifth in landings at 6.5 million pounds. The other top-value species was long-finned squid at $2,125,987. Although Lund's deals with many high-volume, low-priced species, in years where the overseas market is strong, which is usually when the dollar is weak, these landings can skyrocket. In 2004 and 2005 Lund's help lead the port to the best years it had seen to that point. Led by scallops, the Port of Cape May moved up to fourth largest in the nation. New Bedford, Mass. remained the top port for the ninth year in a row with landings of $241 million. It was followed by two Alaskan ports: Dutch Harbor-Unalaska at $195 million and Kodiak at $98.7 million. Other New Jersey ports did not fare as well. Atlantic City, a big port for surf clams and ocean quahogs, which also catches some scallops, saw its take decline from $27,454,791 to $24,082,760. It went from No. 27 to No. 29 in the nation. A price increase in ocean quahogs helped buffer a decline in landings from 22.2 million to 19.3 million pounds. Point Pleasant, Ocean County, saw its value decline from $22.6 million to $22.1 million. Its ranking went from No. 36 to No. 38. Still, fishermen pulled in $23.4 million with the top species in value being scallops, ocean quahogs, surf clams, lobster and fluke. The top species in poundage were ocean quahogs, surf clams, menhaden, scallops, and monkfish. Barnegat Light, which includes other docks on Long Beach Island, also saw a decline, but its ranking increased. Landing value declined from $24.5 million in 2006, to $23.1 million in 2007, to $22.9 million last year. It went from No. 34 in 2006, to No. 35 in 2007, and is back at No. 34. 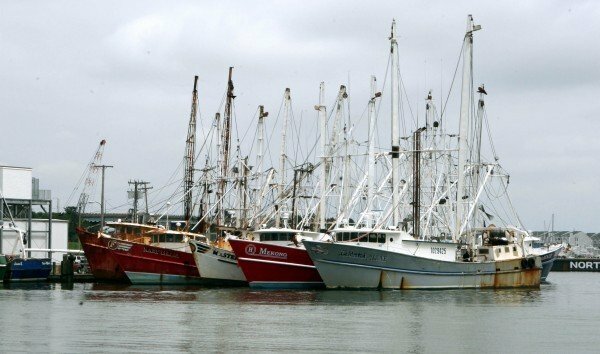 Nationally, seafood landings declined from 9.3 billion pounds to 8.3 billion pounds. The value, however, rose from $4.2 billion to $4.4 billion. 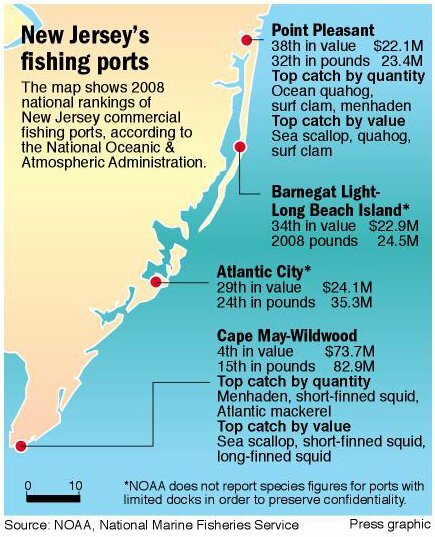 The value of New Jersey's catch rose from $151 million in 2007 to $168 million in 2008. The 162 million pounds landed was well below the 1956 Garden State record of 540 million pounds. NOAA Fisheries Service also released saltwater angling figures for 2008 confirming what most suspected about the consequences of high gasoline prices at marinas last year. Fishing trips declined from 93 million with 475 million fish caught to 85 million with 464 million fish boated. The top catch in the mid-Atlantic was fluke, or summer flounder, while striped bass ruled the states just to the north.